That didn’t take long. 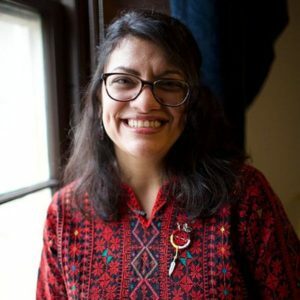 Rep. Rashida Tlaib (D-MI), newly elected to the U.S. Congress, has already posted a “correction” to the world map in her congressional office, marking Israel as “Palestine.” She has thus effectively indicated her support for the Palestinian Arab objective of eliminating the Jewish state of Israel on her first day in office. Rep. Rashida Tlaib has already posted a “correction” to the world map in her congressional office, marking Israel as “Palestine.” She has thus effectively indicated her support for the Palestinian Arab objective of eliminating the Jewish state of Israel on her first day in office. 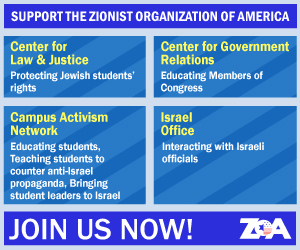 Tlaib has also already accused U.S. senators sponsoring a law against the BDS movement of looking out for the interests of Israel rather than those of America. Her comment is a bit ironic considering that she literally wore a Palestinian flag while pledging herself to the Palestinian Arab cause when she was sworn into office. Present at her swearing-in, incidentally, was Linda Sarsour, a sharia-promoting, Jew-hating Islamist radical who denies for Jews the self-determination she demands for the terrorist dictatorship of Mahmoud Abbas. Sarsour has asserted that there is “nothing creepier than Zionism,” called the Palestinian Authority’s tactic of deploying children to throw rocks at IDF soldiers in combat situations the “definition of courage,” and seeks a single Arab-dominated state on the ruins of Israel. In April 2017, Sarsour shared a platform with Palestinian terrorist Rasmeh Odeh, convicted for the murder of two Israelis in a 1969 terror attack, saying she was “honored” to be on the same stage as her. She has also unhesitatingly endorsed the Nation of Islam – led by the anti-Semitic, black supremacist hate-monger Louis Farrakhan – as “integral” to American Muslim life and even addressed a Farrakhan rally. In August last year, she told Haaretz, “It has to be one state. Separate but equal does not work. I’m only 42-years old, but my teachers were of that generation that marched with Martin Luther King. 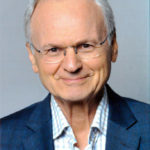 This whole idea of a two-state solution – it doesn’t work.” In other words, there is no room for an independent Jewish state, only one dominated by Arabs. Martin Luther King, meanwhile, was a principled and unambiguous supporter of Zionism and Israel. For her to associate Dr. King’s name with her illiberal and vicious anti-Semitic political views is an utter disgrace. In that same interview with Haaretz, Tlaib called Israel a “racist country” on the basis of the lie that Israel discriminates against those who are “darker skinned.” She has also stated that Israel does not observe human rights and does not deserve U.S. aid. Tlaib is known to openly support the BDS movement, which is committed to the international ostracism and weakening of Israel with a view to its eventual elimination. Rep. Tlaib identifies with Mahmoud Abbas’ Palestinian Authority, a hostile, anti-American regime that has named schools and streets after terrorists and has provided stipends to the families of deceased terrorists in proportion to the amount of Jewish blood they have shed. PA-controlled media, mosques, schools, and camps are suffused with the glorification of terrorism and incitement to hatred and murder as children are educated to aspire to murdering Jews as a national and religious duty. PA terrorism, meanwhile, has claimed the lives of U.S. citizens. None of this, however, appears to bother Rep. Tlaib. The truth is, there were no grounds to hope that Rashida Tlaib would abandon her extremist, anti-Israel views or her desire to see the elimination of the independent Jewish state of Israel. Her record of support for it is clear and unambiguous. It is nonetheless striking, though, that we didn’t need to wait even a day before her horrible extremism was on display – literally – on her office wall.